Delicate and colourful, flowers have long been important symbols of natural beauty and life. 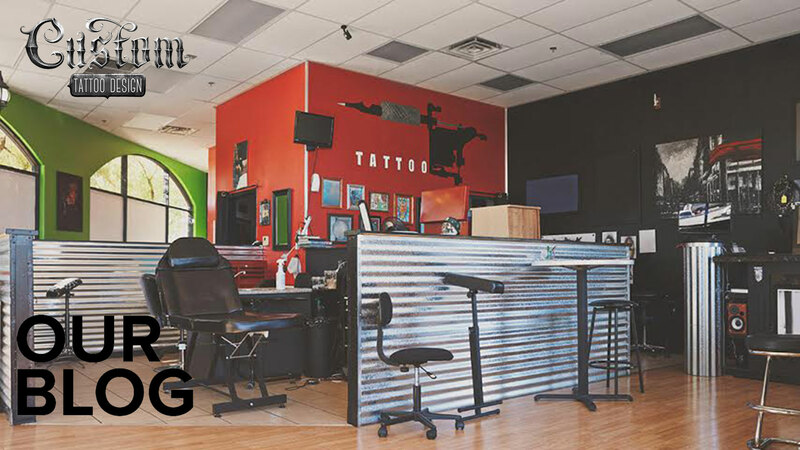 In fact, they’re undoubtedly some of the most prominent tattoo designs in history. 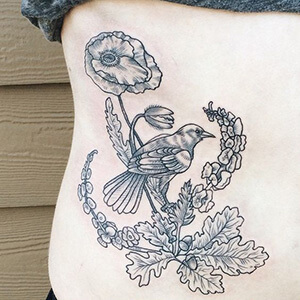 The meanings behind flower tattoos are as multi-layered as they are variable: In ancient cultures, flowers were a direct symbol of god’s contentment. Today, flowers often represent the love between two people. 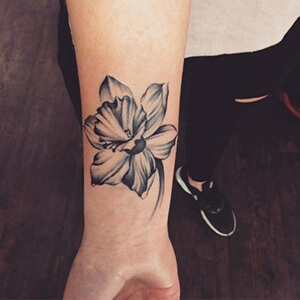 Check out our flower tattoo dictionary below for a comprehensive list of popular flower tattoo meanings. Acacia: this unique plant can be red or white, and in Mediterranean countries it represents life as well as immortality. It is also a common symbol for love and friendship. Amaryllis: usually found in warmer climates in South Africa, this red, bulbous flower symbolizes encouragement or success after struggle. Bells of Ireland: In Ireland, these green bell-shaped flowers are a popular symbol of good fortune. 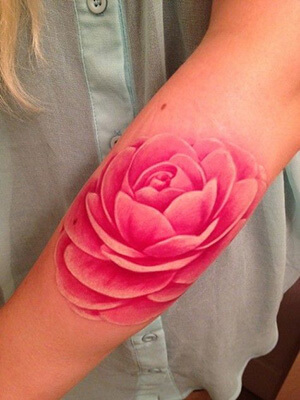 Camellia: this flower tattoo design is a powerful symbol of desire, passion, and perfection. It can also represent longing. Cherry Blossom: common in Japanese style tattoos, the cherry blossom symbolizes empathy and an appreciation for the ephemeral. Since these flowers possess a delicate beauty that fades rapidly, they also serve as a reminder of one’s mortality. 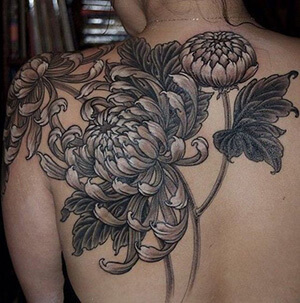 Chrysanthemum: this flower, which blooms in autumn, has come to symbolize the transition from life to death. It also represents royalty and perfection. Daffodil: a mellow yellow flower, the daffodil represents virtues such as honesty, truth, faith, and forgiveness. 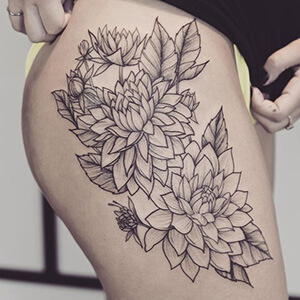 Dahlia: a colourful and spicy flower, the dahlia is a symbol of change, and it can also represent looming betrayal. Blue these flowers represent one’s sentimental or emotional side. Dogwood: as the tree that refused to lend its wood to build Jesus’s cross, the dogwood flower has come to represent empathy and pity. It also stands for unconditional love, or love that can withstand adversity. 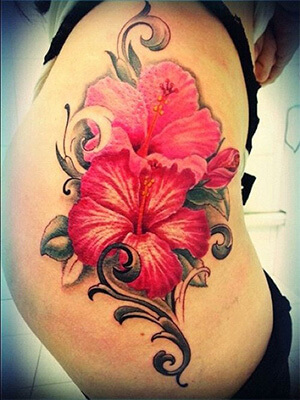 Hibiscus: in Japan, the hibiscus represents gentleness, while in Hawaii, it represents royalty, power and respect. 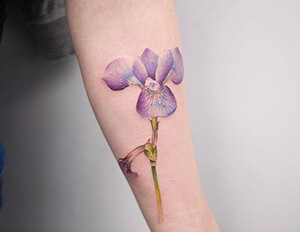 Iris: the iris’s three petals symbolize faith, valor, and wisdom. 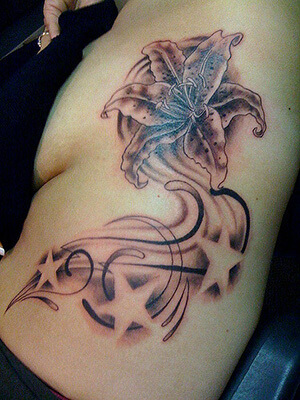 Lily: this tattoo design is a classic symbol of femininity and purity. Blue the blue lotus symbolizes mind over matter or spirituality overpowering impulse or compulsion. Pink this is the flower known as Buddha’s lotus. Purple a symbol that pays homage to Buddhist deities. Symbolizing a mystical view of religion and spirituality. Red commonly known as the Heart Lotus, the red lotus symbolizes the original state of the heart, standing for love, compassion, and passion, otherwise known as the ideal state of the heart. 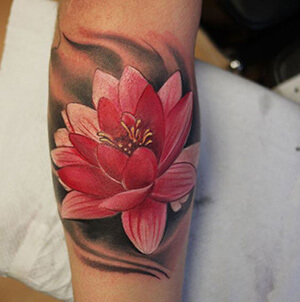 White with roots in Eastern culture, the lotus flower represents knowledge and spiritual enlightenment. 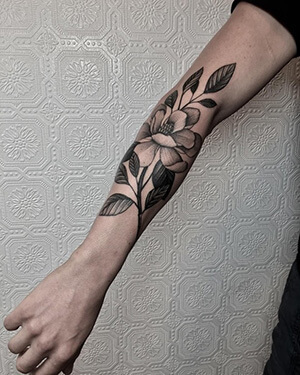 Magnolia: an elegant and distinctive looking flower, the magnolia is a popular symbol for the love of nature, beauty, and life. 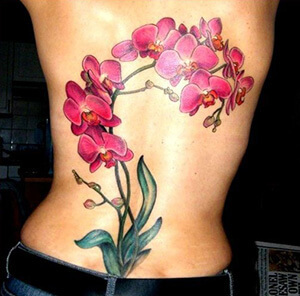 Orchid: in Japan, the orchid is a common symbol for bravery, while, in China, it represents prosperity and fertility. 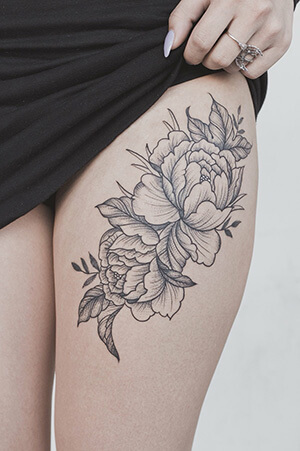 Peony: known as the the King of Flowers in Japan, the peony symbolizes elegance and wealth. 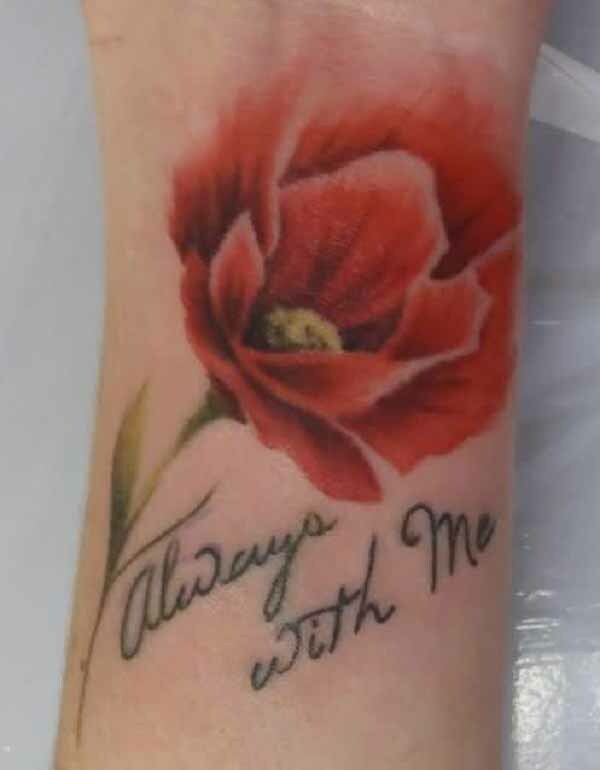 Poppy: this red flower is in remembrance of those who have died in war, and represents eternal sleep. 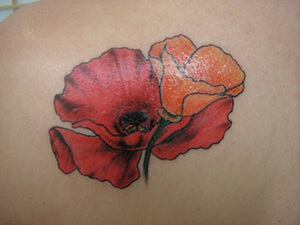 The poppy is featured in the famous poem, Flanders Fields. 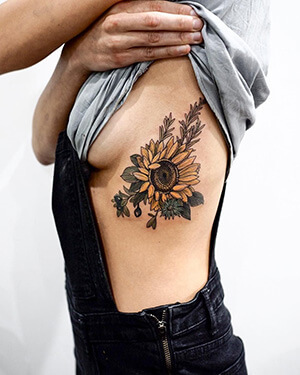 Sunflower: the sunflower was originally honoured by the ancient Incas civilization as a symbol of the sun god, due to its resemblance to the sun. 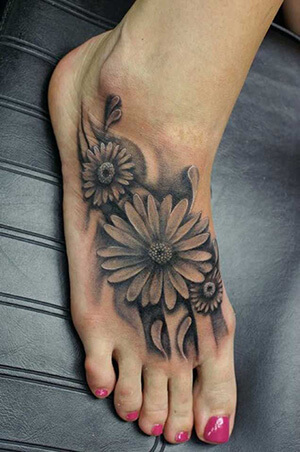 This tattoo design is a common symbol for warmth, happiness, and creation. 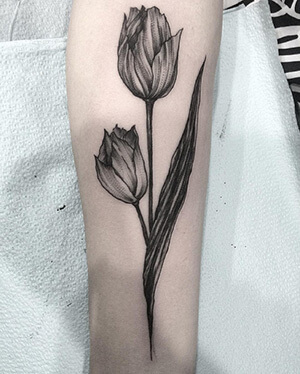 Tulip: vibrantly coloured and delicate, the tulip is symbolic of prosperity and guilty pleasures. There are an abundance of uniquely beautiful flowers that have held great cultural and spiritual importance throughout the ages. 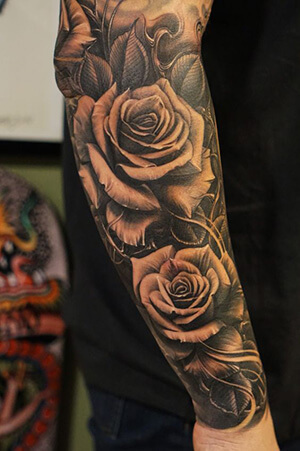 The flower’s look and the meanings behind speak volumes about the environment in which it grows, as well as the people that live there. 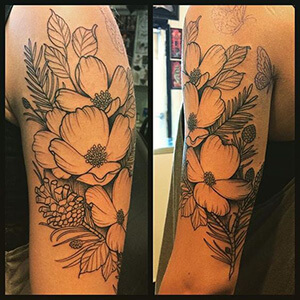 If you know of other interesting flower tattoo meanings, let us know about them in the comment section below!